Shhhhh! Stuffed wild cats and plush wild cats are all around us! If you like your stuffed cats wild then you are right where you need to be. 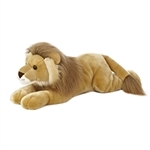 Our collection of plush wild cats includes stuffed lions, plush tigers, stuffed leopards, plush ocelots, and many other breeds of stuffed wild cats. Take a look at the links above to find a specific type of plush wild cat or search through the pages below if you just want to do some stuffed wild cat window shopping. Most likely, the stuffed wild cat you are after will pounce out at you if you spend a little time viewing our vast collection of plush wild cats. Keep in mind, these are stuffed wild cats, so keep your hands off of your screen or you might get scratched or even bitten. Take the utmost care in your searching and, for heaven's sake, please do not feed the plush tigers. They come to expect it and then they think of us as food when we are trying to send them to their new homes which is really no fun for anyone!